While the sun does keep showing its face here, it quickly disappears behind clouds to produce April showers with a bite to the wind. 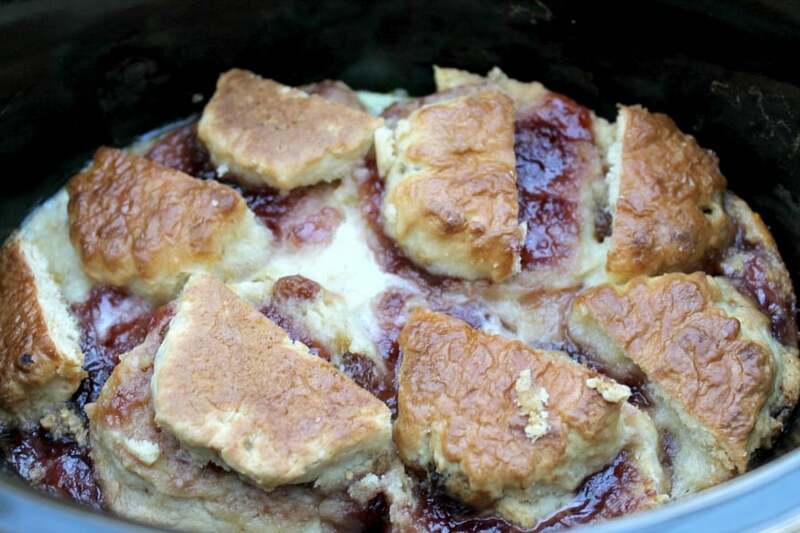 After a long day walking in the countryside and working up a healthy appetite, I found some scones that needed to be used up in the bread bin, and thought I could make a cream tea-inspired pudding in the slow cooker as a treat for the family. 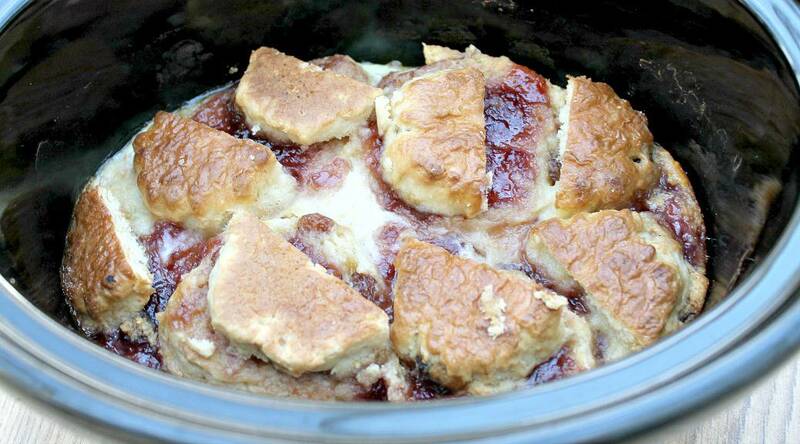 It was time to make a slow cooker strawberry jam and scone pudding! 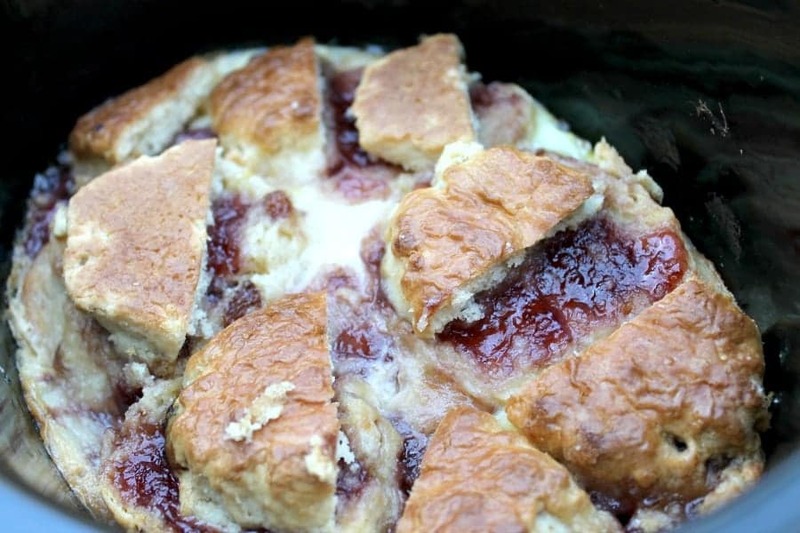 Strawberry jam, sultana scones, and a homemade custard combine to make this tasty warming pud. This is proper comfort food, which if they’re anything like my lot, the whole family will love. 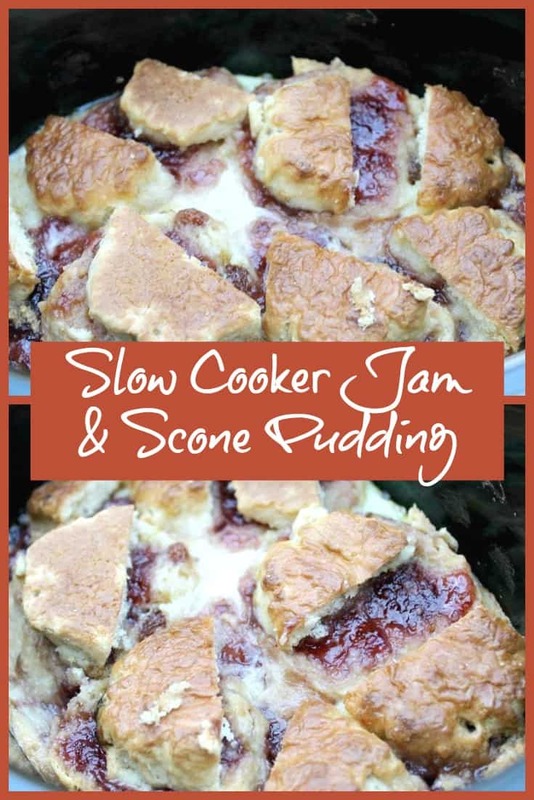 If you like my recipe for slow cooker strawberry jam and scone pudding, have a look at my guide to baking and making puddings in the slow cooker, with loads of recipes and tips for slow cooker baking. You can also find lots more slow cooker desserts in my archives or by using the search function! Slice the scones in half, and spread them with jam. Arrange half of the scones in the base of the slow cooker. Whisk the milk, egg and 4 tsp of sugar in a jug, and pour it over the scones. Add the rest of the scones on top, and sprinkle on the remaining teaspoon of sugar. Cook on high for approx. 1.5 to 2 hours, or until the custard is set, with a tea towel under the lid to catch water dripping off it. Note: I made this in an oval 3.5 litre slow cooker. If you have a larger slow cooker you would need to increase the quantities or it will be very shallow. Thanks Kirsty, it is perfect for winter and also cold spring days I find! You know I always forget that scones exist and I’m not sure why! We need a scone revival! Thanks for joining in with #BAKEoftheWEEK – round up and new week’s linky is now live on my site. I absolutely love the idea of using up leftover scones this way. If only I’d seen this #BakeoftheWeek post earlier today – we have 4 left form this morning’s batch that the kids made! Ooh yes clotted cream on top would be great, thanks Camilla! What a brilliant idea Lucy – next time I make scones I will make an extra set so that I can try it. 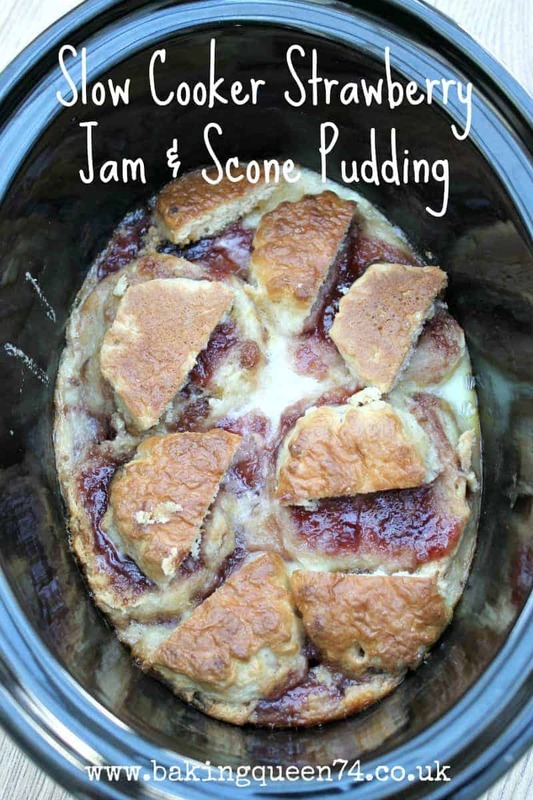 I have yet to make this kind of pudding in my slow cooker (mostly because we would never have leftover scones in my house!) but it looks like pure comfort food. Yum! This looks tasty and easy to make. Wonderful idea to make in the slow cooker. Stumbled and Pinned. What a great idea to use up some scones. I have never thought of using my slow cooker for sweet things … You have opened up a whole new world!